At Passiontide 2004, Judith von Halle received the stigmata - the duplication on her body of the wounds of Christ. Following a period of careful consideration, she eventually decided to share this intimate occurrence with a small group in Berlin in Michaelmas of that year. The phenomenon of the stigmata is usually either seen as a sheer miracle or is simply denied. In contrast, in her first lectures here, she attempts to arrive at a clear understanding of it - based on the spiritual scientific knowledge of Rudolf Steiner - and its significance for one's personal destiny. 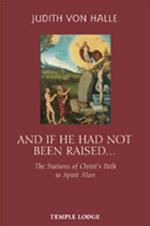 As a consequence of receiving the stigmata, von Halle began to experience the events of the life of Christ in full, sensory detail. In addition, she has explored these events by means of spiritual-scientific research methods - sometimes referred to as 'continuity of consciousness'. In the further five lectures of this volume she offers a commentary to the Mystery of Golgotha, the turning-point in world history. Her intention is to stimulate the reader to reflect patiently and repeatedly upon this great Mystery, and to enter into an ever closer relationship to Christ. JUDITH VON HALLE, born in Berlin in 1972, attended school in Germany and the USA and subsequently studied architecture, graduating in 1998. She first encountered anthroposophy in 1997, and began working as a member of staff at Rudolf Steiner House in Berlin, where she also lectured from 2001. In addition she had her own architectural practice. In 2004 she received the stigmata, which transformed her life. Her first book was published in German in 2005, and she now works principally as a lecturer and author. She lives in Berlin with her husband.